Goa is renown for its beaches, but behind the waves and sand lie beautiful rolling lush green jungle draped hills which shelter a number of sacred worship sites. My taxi cab driver told me that Goa is now 65% Hindu and 26% Christian, which is somewhat different from the traditional websites, which put the Hindu figure at 55%, but either way, it shows that things have changed since the Portuguese gave up control in 1961. There are still a number of churches scattered throughout the various regions that make up the province of Goa, but most of them are only open for an hour early in the morning. In Old Goa one of the main attractions is Dom Jesus, the church where St. Francis Xavier’s tomb is located. Dom Jesus was completed in 1605 and is remarkably plain inside. It is a big structure with a beautifully carved wooden pulpit, side altars and central altar. The main altar has Corinthian like columns on either side to highlight the figure of Francis in the middle with one arm reaching towards the heavens and the other pointing to earth. Above him is a huge sun. Off to the right is his mausoleum, which was donated by the last of the Medici rulers, Cosimo III and sculpted by the Florentine Foggino in 1698. St. Francis Xavier is honored by the Church, after all he was made a saint, but from another perspective, he was a tyrant and his intolerance for other religions led to the persecutions of the Hindu and Muslim communities during the Inquisition in Goa. The Inquisition was as terrible here as it was in other parts of the world and St. Francis Xavier was most definitely part of it. Across the street from Dom Jesus is the Church of St. Francis of Assisi, which was consecrated in 1661. While this church is less elaborate than its European counterparts of the same time period, it is a bit more intricate than Dom Jesus. It has a series of Roman arched chapel niches on either side of the main aisle and the transept is quite shallow. The elements within the church are again primarily made of intricately carved wood, but there are also a series of paintings by the altar portraying the life of St. Francis of Assisi. Off to the side of the Church in a one story structure is the Archeological Museum, which unfortunately I was not able to visit as they charge for admission and I had mistakenly left my wallet in the hotel room. The Se Cathedral on the other side of St. Francis of Assisi is a very impressive structure and is said to be the largest church in Asia. There are also a number of well-known Hindu temples in the region, but I could only visit two of them. The first was the Shri Mangueshi Devashan, which is dedicated to Lord Shiva in the form of a Lingum. The temple is about 400 years old and survived the Portuguese because by the time they conquered this part of the region the Inquisition had past and there was greater toleration for other religions. To get to the temple there is a fairly long paved walkway that leads up to a normal sized flight of stairs. I mention this because almost all of the temples in the Himalayan region are up many hundreds of stairs, but not here. In fact, the temple wasn’t even on top of the hill, but in a nice bowl slightly raised from the surrounding area, but not towering over it. Once in the courtyard, I could see a lamp tower immediately in front of the entrance to the temple, which looked very much like a church from the outside. The lamp tower could also easily have been a bell tower. The deity was behind a couple of layers of silver plated gates with quite intricate designs etched in as well as done as reliefs. Off to one side was a gentleman behind a desk taking orders for special prayers that the faithful were commissioning. Others were offering their flower garlands and leaf baskets with petals, rice, fruit and candles to Bhagavan Manguesh, an incarnation of Lord Shiva, and the central deity. The second temple I visited was the one dedicated to Shantadurga, the goddess who mediates between Vishnu and Shiva, i.e., between stability and change. Structurally, this temple is not dissimilar to Shri Mangueshi; it also has a distinctly church looking atmosphere. The lamp tower is not directly in front of the entrance, but slightly off to one side, but could again function as a bell tower if it were for a different religion. The deity here is also housed behind silver plated double gates, but there is a path behind the central shrine for worshippers to take as a kora. Near the beginning of the path off to the left is a small room with two Durga icons. The smaller one is dressed in a red dress and is seated in the middle of a sofa and the second larger one off to the left of the first from the viewer’s perspective is dressed in blue and is seated on a chair. Both of them could easily be mistaken for Madonnas with just a couple of small changes to the way the dresses were arranged. The central shrine with the main idol has a series of wooden figures above the doorway. At first I thought they were the nine Durgas, but no, there were also images of Shiva and Vishnu in various incarnations and emanations as well as a few of the Durgas. In the very middle were small statues of Laxmi, Durga and Saraswati. Laxmi and Saraswati were also evident in paintings by the entrance doors. I had a bit of trouble seeing the central deity as the priest was bent down over the icon while I was in front of it and there was a line pressing me to move on. What I could see, however, was a small draped figure, which could well have been a stone much like those in Nepal, that had three other draped statues of Durga above and behind it in order of height. Then on either side between the two tallest central Durgas were two more, which in a sense formed a cross. I’m sure this wasn’t conscious, but it was something that I noticed and found interesting given Goa’s history. On the sides of the sanctuary were two silver relief guardian figures. They had different stances and one was thin while the other had a bit of a pot belly, but the faces were strikingly similar and resembled Sai Baba, who is one of the leading contemporary saints in this region. As the temple has been renovated and by the looks of things remodeled fairly recently, I wonder if these aren’t new changes. In addition to the churches and temples, I did make it to the Goa State Museum, which isn’t at all the way it is described on the website. It has a rather small collection for a state museum, but it does have a number of interesting Hindu deity stone sculptures from the 10-14th C. as well as some Christian artifacts. It also had three different kinds of palanquins, which I found interesting as they all looked terribly uncomfortable. I think it would have been much easier to walk than ride in any of them. 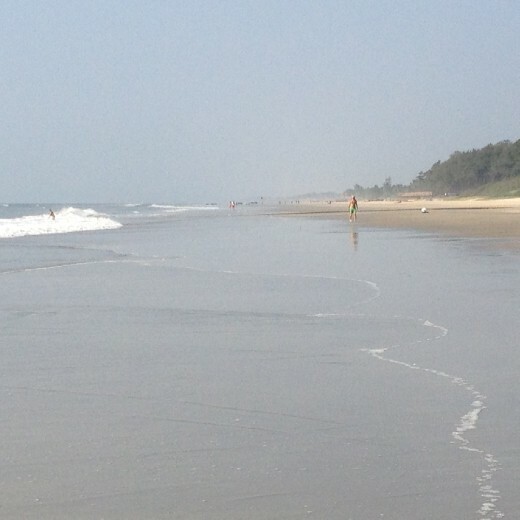 Goa has a fascinating very long history (it’s even mentioned in The Mahabharata) and the beaches are truly wonderful.